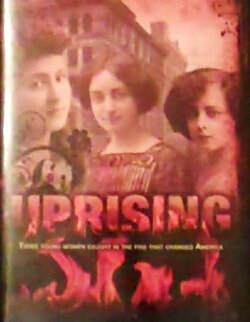 Three girls living in New York in the early 1900s face different challenges, but unite in support of workers' rights. Bella, alone and newly arrived from Italy, does not speak English, but her cousin helps her get a job at a factory. Yetta, from Russia, works at the same factory, but she dreams of making huge changes in the world, instead of the shirtwaists the factory produces. Jane is a wealthy American, with growing discontent about the parties and pointless social rules that make up the bulk of her life. This is my favorite book by this author. The pacing moves quickly, and each character's story is distinct and compelling. This would be an excellent book to read in conjunction with a history unit about this period in American history, or with any social studies unit about revolutions or class structure. The author weaves details about each of the character's lives into the story vividly, so that even readers who are accustomed to iPods and air conditioning can clearly envision the cramped tenements and harsh working environment. The girls are caught between traditional expectations and unjust treatment, but each finds a way to deal with it on her own terms. With references to unsafe working conditions and activists who support the right of women to vote, this book is full of discussion opportunities for students. "If there's a union, the whole shop all together, then the bosses cannot cheat you anymore. It's not just one girl, standing alone, saying 'Why did you only pay me three dollars this week?'"